This classic, light and fluffy sponge is given a makeover with an indulgent rhubarb and cream cheese filling. Preheat the oven to 180°C, gas mark 4. Grease and base line 2 x 18cm sandwich tins. Put the butter, sugar, vanilla, eggs, flour and baking powder in a bowl and beat with an electric whisk until smooth and creamy. Divide the mixture between the tins and level the surface. Bake for 25 minutes or until risen and just firm to the touch. Transfer to a wire rack to cool. Increase the oven temperature to 200ºC, gas mark 6. To make the filling, line a baking tray with baking parchment and scatter with the rhubarb in a single layer. Sprinkle with 2 tbsp of the sugar and bake for 20 minutes, or until tender. Leave to cool. Whisk the cream cheese in a bowl with the remaining sugar until thickened. In a separate bowl, blend the rhubarb preserve with 2 tsp boiling water. 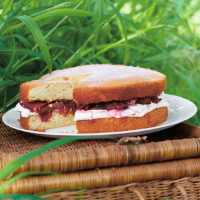 Spread the cream cheese over one of the cakes, arrange the cooled rhubarb on top and drizzle with the preserve. Place the second cake on top and lightly dust with caster sugar to serve.